I did a silly thing this month – I allowed myself to get optimistic. Reports from those receiving copies of the latest Haruhi disk earlier than myself over at AoD were positive, with a couple of people landing their first film strips of the series. Faced with such evidence, I couldn’t help but start to ponder – had they, perhaps, increased the percentage of copies carrying said extra in an attempt to maintain their sales? Perhaps the random nature of the shipping had seen CDJapan receiving a stack with copies carrying this most elusive of extras this month. Whatever the case, somehow I was feeling strangely positive about this months release. Yup, it’s a pretty normal looking haul isn’t it? I don’t know about you, but I just find that there’s some incredibly unnerving about a smiling Yuki. Aside from that, it’s the usual postcards, the coaster and, as with the previous volume (and we already knew to expect with this one), the mini-clearfile. Oh, and it looks like there’s something else tucked away in there. Something rectangular, and all celluloidy. Filmy, some would possibly describe it as. Almost like a film strip. YES! 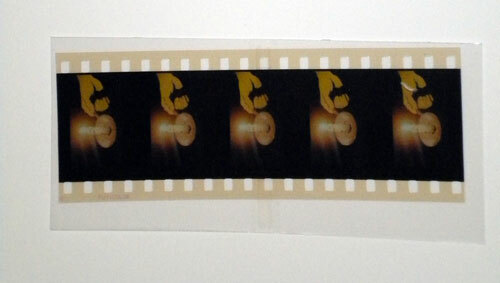 Finally proving that they do, infact, exist – it’s a film strip! 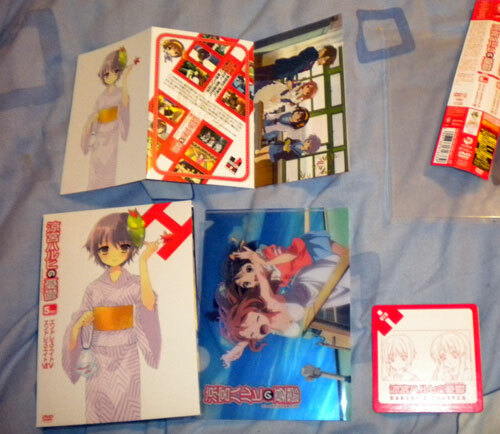 A film strip of… of…… DAMN YOU CHAIRMAN KADOKAWA! I think this is what they call “Grasping Defeat from the jaws of Victory”. Finally I land a film strip, yet it’s quite possibly the least interesting one I could possibly get. I mean, it’s a hand holding a candle. 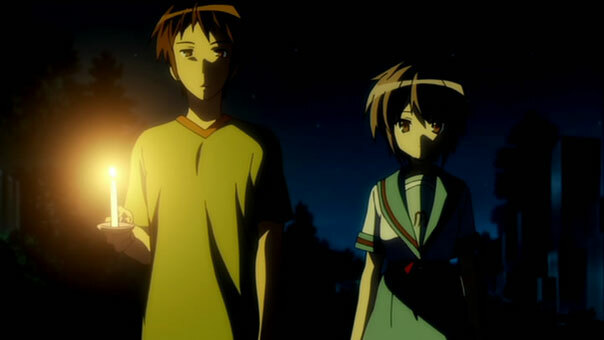 Kyon’s hand, at that – not even a female character. Honestly, I’ve mixed feeling about this. On one hand, it’s arguably more disappointing than if I’d not gotten a film strip at all. On the other hand, even I can’t help but find it hilarious. I’m not even sure how I’m supposed to tally this one up. I suppose the mere fact that I got the film strip means I should chalk it up as a win, however bitter a victory it may seem. 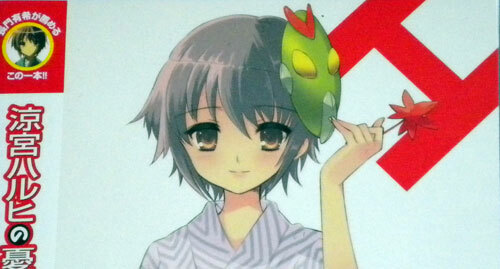 That makes the running total for Haruhi Season 2 DiGiKerot 1, Kadokawa Pictures 3. I guess this means I’m still in the running as far as potentially winning the series going, though I’m not optimistic in the long run. Yuki looks like kazumi from shana. I always somehow manage to forget that Noizi Itou did the original designs for Haruhi and not just Shana. Hmmm, I wonder why on Earth that comment was flagged as spam. Since you’ve now seen physical film, you can definitively answer this question: how wide is it? I’m glad to see you finally got a strip as well. I’ll have to upload and link my two strips as well. Sorry you got a not-so-great one, but there’s some that aren’t any better (like a shot of the list from Endless Eight II). About 25mm from side to side, or 32mm diagonal. Not that it really matters, given that the film print would only have been made for them to cut to pieces for the DVD release. Sorry you got a not-so-great one, but there’s some that aren’t any better (like a shot of the list from Endless Eight II). I’ve taken the best quality picture that I could of the strips I have received in my DVDs for a comparison. Apparently Amazon Japan thinks I’m a big fan of Kozumi-kun since he’s in both of mine. Luckily my Shana movie gave me a 4 cell strip of a car. 3&4 i get later on 1st christmas day.